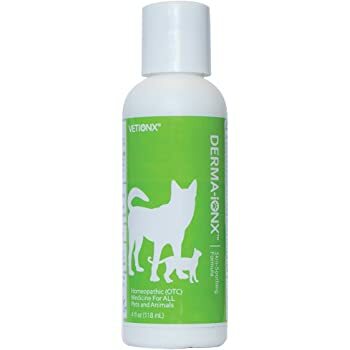 Derma-Ion X is a liquid homeopathic medicine for relieving various symptoms of your pets’ skin irritation. Derma- Ion X for dogs is an FDA registered medicine which ensures the quality of the product. Derma- Ion X contains natural ingredients to provide that safe and steady healing without any side effects. It helps supports skin care and a healthy lifestyle. Dogs experience the gentle relief without inducing any side effects in the recovery. The product comes in liquid form which makes it easy for ingesting into the dog’s system without much effort. The medicine can be served directly into the mouths of the dog using a plastic dropper which is generally included along with the product. The dropper should be kept clean. It should not come into contact with any outside items. When applying the medicine into the mouth, the user should be careful not to touch the dropper to the tongue as it can lead to contamination. Mix the solution with the water bowl which is a much more comfortable mode of ingestion of the medicine and all objects should be non-metallic. It is because metals can change the effectiveness of the product. The product can also be applied directly into the skin of the pet. It can be done by mixing the undiluted Derma- Ion X directly into a spray bottle. It is also essential to part the coat of the pet to get direct contact to the affected areas. Store it in a cool place which is also dry. The product should not be exposed to sunlight as it can change the efficiency of the medicine. Use the product within 60 days of its opening. All the ingredients used in Derma- Ion X have been selected based on their traditional role in medicinal values. Derma- Ion X uses minute potencies of the ingredients to relieve the pet from the symptoms of skin irritation. The formulation of Derma- Ion X has been formed according to an intrinsic body response. It is known as “Law of Similar” which is very efficient to give natural symptom relief by diluting fo the ingredients. Derma- Ion X doesn’t have synthetic additives, colors, flavors or any forms of sugar or gluten which is one of the main reasons for the lack of side effects. Active ingredients of Derma- Ion X: Agaricus Muscarius, Alumina HPUS, Anagallis arvensis HPUS, Antimonium Tartaricum HPUS and so on. HPUS stands for Homeopathic Pharmacopoeia of the United States. There are lots of positive Derma- ion x reviews. Derma- Ion X is not an alternative or replacement for any medicines which is prescribed by a vet. Derma- Ion X is one of the best drugs which are available in the market to naturally relieve skin diseases and the irritations related to the condition.